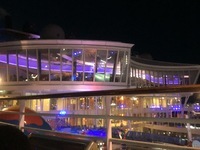 Royal Caribbean set a decent standard for future cruises (while on the ship). 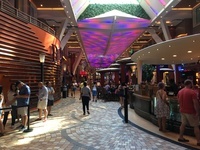 The ship was clean and had high end finishings; I However, the cruise check-in staff at Port Canaveral were rude and uncaring. As a first time cruiser, I was unsure of where to go and what to do and I found myself being barked at by employees on multiple occasions. On the ship everything was smooth sailing. I enjoyed the many activities that the cruise offered, but I’d like to see more late night activities, as there was nothing to do after midnight besides eating pizza. The dining experience was by far my best experience. My servers Komang and Eri were nothing short of spectacular. They provided stellar service. The dining menu offered various food choices, all of which I found delicious. The show “Cats” was absolutely horrific. I was put to sleep after the first 15 minutes of the show. I would not recommend this show. More than half of the audience filed out of the show at intermission and didn’t return. It was by far one of the worst activities on the boat. Overall, besides the terrible check-in experience at Port Canaveral, I thoroughly enjoyed my cruise. The excursion tours were thrilling and exciting. 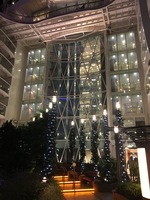 I would like to see the check-in issues resolved in the future. 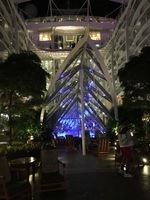 Royal Caribbean set a decent standard for future cruises (while on the ship). 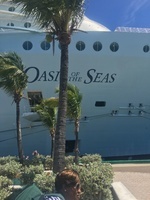 The ship was clean and had high end finishings; I However, the cruise check-in staff at Port Canaveral were rude and uncaring. As a first time cruiser, I was unsure of where to go and what to do and I found myself being barked at by employees on multiple occasions. On the ship everything was smooth sailing. I enjoyed the many activities that the cruise offered, but I’d like to see more late night activities, as there was nothing to do after midnight besides eating pizza. The dining experience was by far my best experience. My servers Komang and Eri were nothing short of spectacular. They provided stellar service. The dining menu offered various food choices, all of which I found delicious. The show “Cats” was absolutely horrific. I was put to sleep after the first 15 minutes of the show. I would not recommend this show. More than half of the audience filed out of the show at intermission and didn’t return. It was by far one of the worst activities on the boat. Overall, besides the terrible check-in experience at Port Canaveral, I thoroughly enjoyed my cruise. The excursion tours were thrilling and exciting. I would like to see the check-in issues resolved in the future. The room was small, but I got some of the best sleep of my life on the bed. It was extremely comfortable. The staff at the check-in were awful. They were rude, lacked respect and patience. I traveled with grandparents and others and they yelled/barked at us for not knowing where to go. 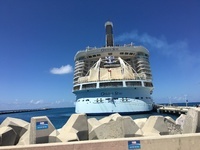 It was so bad, I began to call Royal Caribbean before I boarded the ship to complain. Great beach day with friendly people.